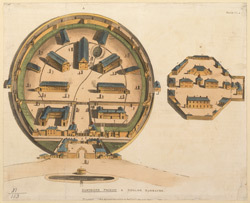 View from above showing the layout of Dartmoor Prison and a barracks for English soldiers. The prison was begun in 1805 on a 15 acre site in Princetown. Princetown was in a bleak part of Exmoor, an ideal location for a prison. It was intended by Sir Thomas Tyrwhitt to provide barracks for French prisoners of war, who had previously been held on hulks. It was designed by Daniel Asher Alexander who followed the continental fashion for laying out the barracks like the spokes in a wheel. The troops were stationed around a perimeter wall.